Wondering About the Rescan? Here are the FAQs. ABC10's newest technology now allows for all Northern California viewers to enjoy quality programming such as The Ellen Show, Jeopardy, Wheel of Fortune and the entire ABC primetime lineup. What does it mean to rescan my TV? If you watch TV with an antenna, over-the-air, either through the digital tuner on your TV or on an older television using a digital converter box, you will want to rescan the channels today. Our team of engineers have been working with new technology to improve both the strength and quality of the ABC10 signal for those who may have had a tough time watching us with their antenna. We’ve finished the testing phase of these improvements and are ready for our viewers to enjoy our programs. But you have to rescan to get those benefits. No need to wait, rescan today! How do I know if I need to rescan my TV? Even among manufacturers, each television has its own steps for rescanning. Every remote is different, too, and often the words ENTER, OK, or SELECT are interchangeable. The process remains basically the same. To begin scanning for channels, use your remote to find the MENU or SETUP or SETTINGS function. The UP/DOWN, and LEFT/RIGHT buttons on your remote help you move from step to step through the on-screen menu. You’re basically getting into the brains of your television to TELL it what you want to see. If you’re having problems finding the right menu, you may need to take a look at the manual for your TV or converter box. If you no longer have either manual, find the model of your television (usually shown on the rear of your set) and search online to get the manual that matches. 1 – Press the MENU button on your television or converter box remote. 2 – Go to SETUP or SETTINGS. 3 – Go to INSTALLATION or SYSTEM or CHANNELS. 4 – Go to AUTOPROGRAM, AUTOSCAN, AUTOTUNING, PROGRAM CHANNELS, or SCAN CHANNELS. 5 – Press ENTER, OK, or SELECT to start the scan. 6 – Some televisions may warn you that starting a scan will reprogram your channels. That's OK! Reprogramming your tuner is exactly what you want to do to access the upgrades and new channels. 7 – Once the scan starts, it can take between a few minutes or 15 – 30 minutes to complete. Be patient! DON"T stop the process once it starts or you’ll have to start all over. 8 – At this point, your scan should be done. Many televisions quit the process on their own, with others, you may need to select OK or EXIT on your remote. You may get a prompt on your TV screen that says this or tells you what to do next. NOTE: Some manufacturers have you use the LEFT/RIGHT arrow to access menu functions. Sometimes they throw you a curve ball and make the CHANNEL UP/DOWN and VOLUME UP/DOWN double as menu navigation. It can be a bit tricky, but if you're familiar with your television remote, you probably already know this stuff. If all has gone according to plan, you're getting ABC10 (and maybe a few new channels!) to watch and a better, stronger ABC10 signal just in time for great election, holiday, or sports programming. Be aware that antenna viewing is often affected by the time of day, the temperature, rain, snow or other environmental factors. I’ve tried to rescan my TV but it still isn’t working! What do I do? If you’ve tried rescanning your TV using the above instructions or your instruction manual, first try rescanning at a later time. If it still doesn’t work, there might be an issue with your TV. If this is the case, contact the manufacturer. If you have questions, or need some help, ABC10 has a call-in line at 916-321-3251. Your call will be returned in 24-48 hours. 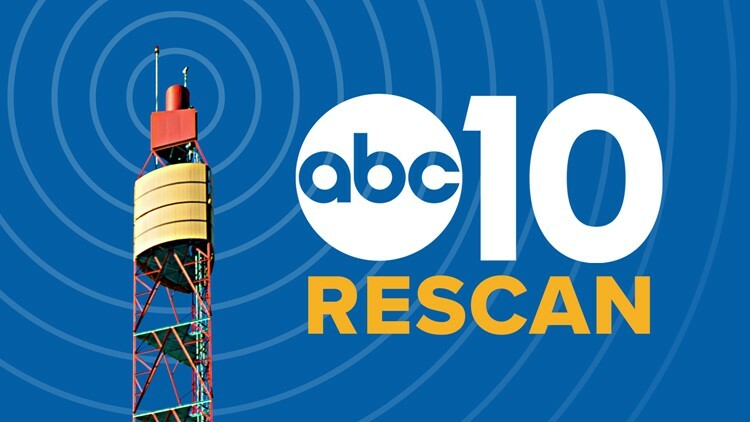 You may also email rescan@abc10.com to ask a question or request a callback.